Over the years people have in the winter months afixed ( tightly ) a rope across the river from the beach area on the opposite side of the hotpools over to near the area of the Crab Cooker. People then bring various rafts and use the rope to pull themselves across the cold water. This system works pretty well when the creek runoff is basically slow ( and the rope is close enough to the surface of the creek ), which provides little current under the rope. But when the current starts running quicker given big rains or increased snow melt, people on rafts crossing while using the rope find themselves increasingly fighting the current pushing them downstream. It becomes harder to pull yourself across without tipping the raft over. When I take my River Rat, I don't use any rope that might be there that is tied tightly from side to side. I attach about 100 ft of light rope to each side of the raft, then tie one of the ropes to something solid on the beach side, then I get my stuff together and put it in a big trash bag to protect it from water putting this bag on my belly when I lay back in the raft, then I enter the water a ways upstream from the beach, paddleing into the current coming downstream at a point generally straight across from the big pool ( the Womb ), this way when you enter the main current area, you then start getting pushed downstream, but in the process, you end up coming out on shore around the Crab cooker area. Doing it this way you account for the current, and don't have to fight it like can happen in strong currents at the tight rope. 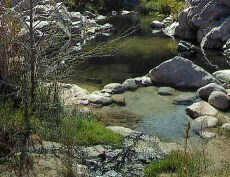 When across I tie the second rope off to something solid on the hotpool side of the creek. Set up this way, the raft can be accessed for crossing from either side of the creek. You should try to have the rope on the ground on the side of the creek the raft is, layed out such that it won't get tangled when someone tries to pull it across to the opposite side. Also the grommets holding the rope to the raft are not indestructable, so people pulling on the raft with the rope should pull fairly gently so as not to ripe the grommets out. When the River Rat is filled up full it can keep you all the way out of the water, with only your hands that are paddling having to endure the cold water. I always lay back facing up, laying across the hole in the middle, paddling backwards across the creek. When I have set this up before, basically most people would use it. At the end of my visit to the springs I would advise visitors that I was leaving soon and that if they wanted to cross on the raft they should do so since when I crossed I would be taking the raft and ropes with me.